Shortcode is a concept from WordPress that allow you to call a lot of WordPress elements. It’s really a great tool for complete your creating experience with Muse to WordPress. 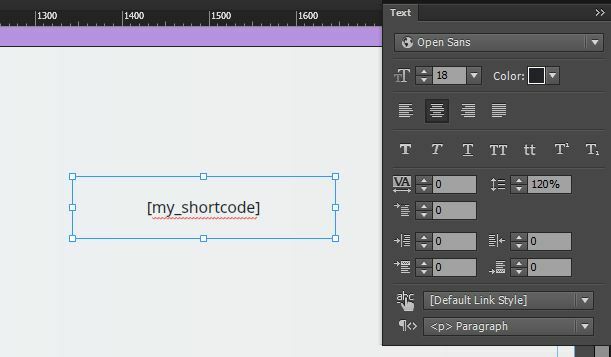 How to use shortcodes in Muse to WordPress? It’s really easy to use it! Just write it with “Text tool” like a text and place it where you want. Use Adobe Muse text panel to define text and link style. You need to launch your theme in a Muse to WordPress installation to see the result. Some shortcode return URL and can be used directly in the Adobe Muse Hyperlink. Often, plugins have shortcodes, you can find it on editor website or in plugin description. There is also plugins only bring you shortcodes collection. to a muse-website. First I’ve added this widget to the functions.php and then I added a menu to that widget-area. So far so good. But whatever I put in the second part, nothing changes. It keeps on showing the content of “Sidebar-1”. the name is only if you are using custom sidebar, normally there is an unique name for each one. Ok.. whats shortcodes are used in MTW and what is use for every shortcode ? MTW purpose basic shortcodes for WordPress, other shortcodes can be find by plugin. Hi, i’m new! I like to know why my contact form is showing that way… What should i fix? Hello, your are using a plugin that create an Iframe and size in height is not good. Use css to fix it.